Taxes are paid nations are made. Taxes are good for our country. One should pay tax honestly. You must have heard these sayings many times. India is developing country, the tax amount is used for building nation (infrastructure & other development), to increase arms, ammunition for defense of the country and for other welfare-related work. Everyone should pay taxes. We believe in this philosophy and pay tax honestly on time. Thus, taxes are now an inseparable part of common man’s life in India. A common man cannot imagine their life without taxes. Starting from earning money to spending money common man of India pays taxes everywhere. Once you earn money you need to pay income tax. If you spend money you need to pay GST. Be it rich, poor, labor, salaried people, businessman or solider (fighting for our country taking risk of his life) everyone pay taxes. The only exception is for few uncommon people. These uncommon people of India are blessed with tax-free income. They need not pay taxes on their income and they are non-other than farmers, MP, MLA, Prime Minister and President of India. They have rights to become rich by not paying taxes. We can indirectly say that they don’t have any liability towards the country. Their income cannot be used for welfare-related work of our country. They are uncommon. The law and rights defined for them are different. They are only people who are working for our nation. Solider and other common man are working for themselves. Taxes are for common man and advantages are for Uncommon Man (MP, MLA, President, and PM). You may not be aware that in the recent budget 2018 finance minister who has not given any benefit to the common man of India has proposed changes to refix emoluments to Parliamentarians with effect from April 1, 2018. The proposed role will provide an automatic revision of salary every five years according to inflation indexation. In addition to salary rise MP,MLA’s will be getting budget benefit extended to senior citizen which includes exemption of interest income Rs.50000 per year towards savings deposit, fixed deposit and post office scheme. If salary rise along with law of revision can be proposed in budget why taxes on income cannot be proposed? 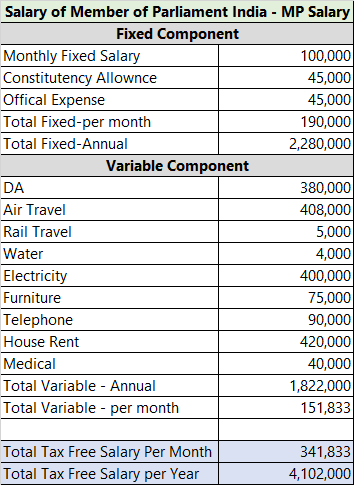 You may be surprise to note that total salary of single MP per annum is 40 Lakh. Detail breakup is available below. This entire salary is tax free. Total we have 1580 people that enjoys this benefit. All these are coming from taxes paid by the common man and that is also tax-free. Let’s take a look at how many types of taxes paid by us. After removal of 20 types of indirect taxes, single tax GST is introduced. Still, we have 10 types of taxes in India. All indirect taxes including service tax is converted in to Goods Service Tax. 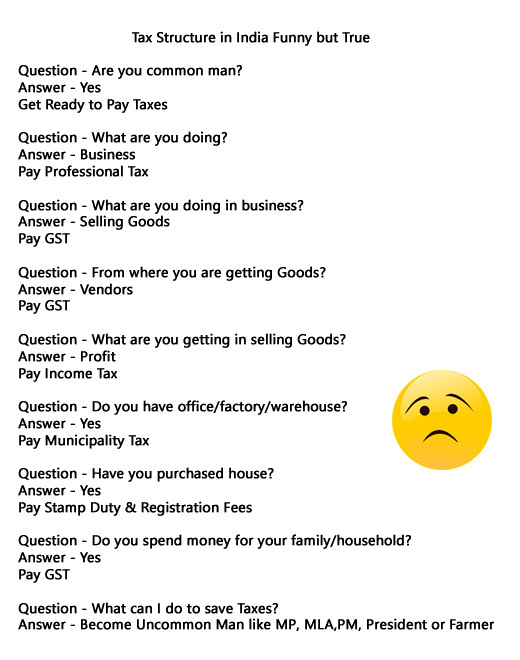 For all products and services we have to pay GST. Education and health cess is deducted and used for poor people health and education related expenses. All taxes in India including income tax is subject to this cess, which is 4% of the total tax payable. Short-term Capital Gains Tax is applicable on capital assets including share and real estate if these assets are held for less than 1 year. The Long-term Capital Gains Tax is charged if the capital assets are kept for more than certain period 1 year in case of share and 3 years in case of property. Security Transaction Tax is applicable for every transaction done at stock exchange. That means if you buy or sell equity shares, derivative instruments you need to pay STT. If you decide to purchase property than in addition to cost paid to seller. You must consider additional cost to transfer that property on your name. That cost include registration fees, stamp duty and transfer tax. This is required for preparing legal document of property. Dividend distribution tax is the tax imposed by the Indian Government on companies according to the dividend paid to a company’s investors. Dividend amount to investor is tax free. At present dividend distribution tax is introduced on MF @10%. India is a democratic country but in India, no one cares about the rights of a common man, so the life of a common man in India become very miserable. The common man of India is polite, He is ready to accept everything without uttering a single word or asking any question. From price hike to tax rate hike from demonetization pain to GST, he is ready to accept anything and everything. A common man is too busy. He has even no time to protest against anyone. He has even no time for himself. He has to work for himself, his family and even for the government. Every common man spends 70% of his life working for his family and 30% for the government. Confused! I am talking about Income tax which eats away 30% your income. Every month before paying anyone he/she pay to the government via TDS. Let’s do some maths. Although you are working 100%, effectively you are getting paid for 70% of work. So out of your entire 40 years career, you work 12 years for the government (If you are in 30% tax slab). If you add 4% Cess, 18% GST (which is now common for every penny spend) and other taxes, you are working almost 50% of your life for the government knowingly or unknowingly. Dedicated to all Common Man of India! Note:- If you are common man. Please don’t forget to share this article with your friends. Tax is base for our Indian economy.If one pay tax to IT Department, actually they develop indian economy. So much deduction are allowed by income tax act as per 80c to 80u in order to increase tax returns. Man not changes why & how you expect to change us. Truth has been spoken in this article. A nice satire on M.P.s and MLAs who are uncommon men/women and therefore entitled to tax free income.